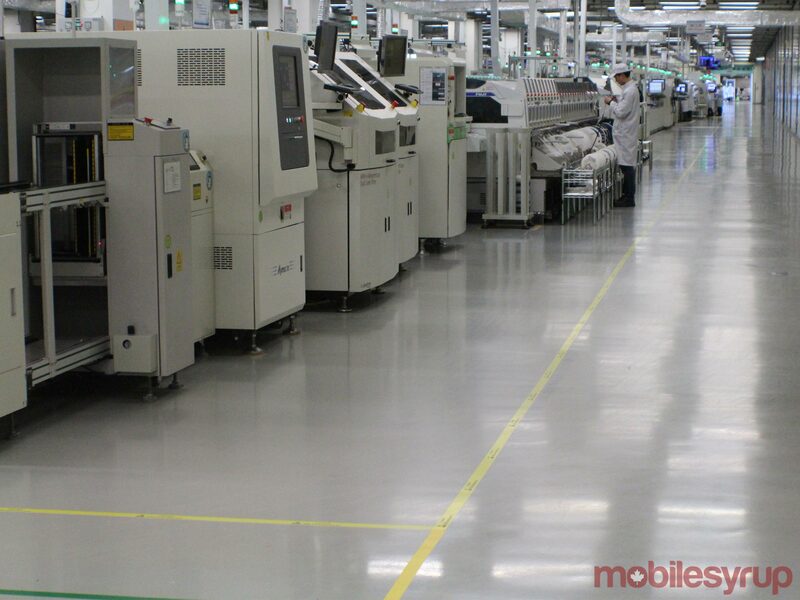 In a large, closed off factory, a smartphone production worker walked through the 120-metre factory line and explained how Huawei manufactures its smartphones from start to finish. The smartphone and telecommunications equipment giant said we weren’t allowed to take pictures, which I guess is fair since the China-based company doesn’t want its intellectual property to be stolen. We were allowed to take pictures in two designated areas, but that doesn’t really capture the enormity of each production line. Imagine a long, cream-coloured facility that houses 35 different production lines. Each line produces 2,400 smartphones in one day; in an eight-hour day, that’s 300 phones per hour. Now multiply that number by 34; that’s 81,600 smartphones in 24 hours. That is a lot of phones. 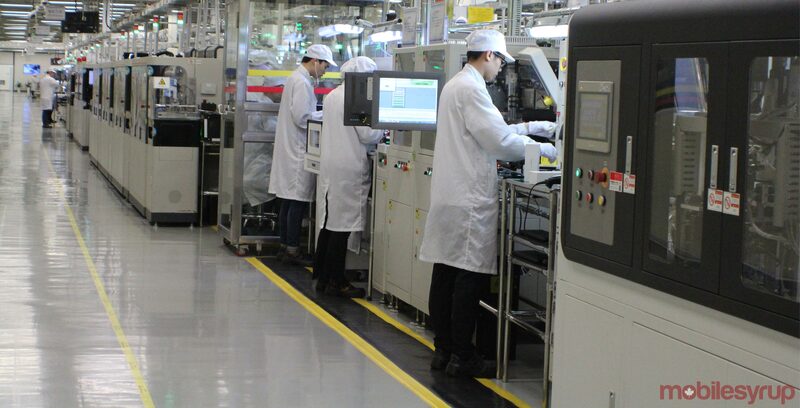 This specific production facility was focused on the production of Huawei’s P20 smartphone. Huawei toured three reporters, including me, around one of its production facilities in its Shenzhen, China campus. The woman leading the tour said Huawei has similar production warehouses in other areas of China and around the world. That said, she wasn’t specific in terms of how many Huawei is currently operating. What is mind-boggling is that in 2013, each production line had 86 workers attached to it and now, only 17 are designated to each line. The tour guide told us that over the years, Huawei learned to be more efficient. The purpose of cutting down people was to produce phones that were quality driven, says the company. Almost everything is still double checked by a factory worker, even if automated machines are now in control of the majority of production, including testing audio, camera quality, and software. The start of the line begins with the creation of the phone’s motherboard. Huawei’s machines create two motherboards at the same time. First, the top is printed on, then it rolls over and the bottom is printed. Finally, the motherboard is split in two so it can be placed on the backside of the phone. Once the motherboard is soldered, laser printed and split, it’s transported to where Huawei says, “components” are fitted. These components range from the phone’s processor, memory chips, and various other parts that allow the device to function. Huawei said the P20’s motherboard features 1,200 components, but that number varies for different phones and what each device is capable of doing. 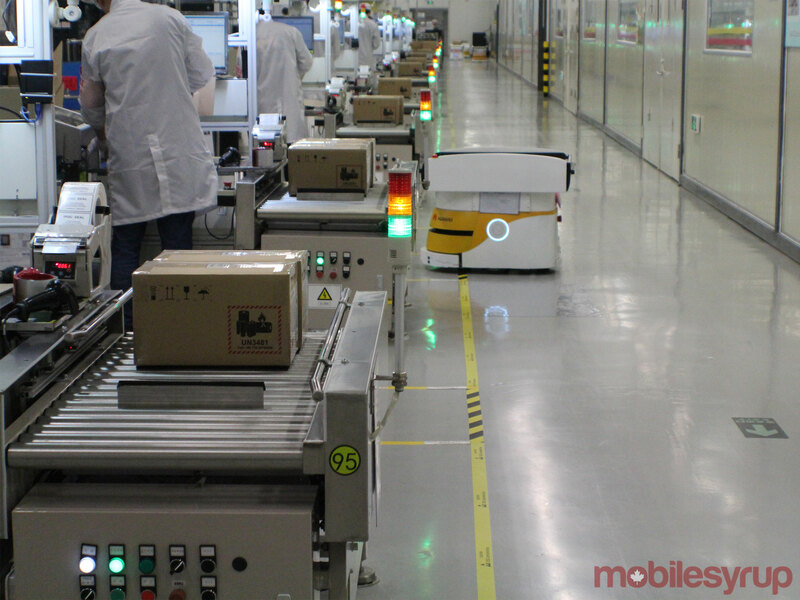 The bottom half of each phone is then swiftly processed through conveyor belts and basic testing software is added. At this point in the process, Huawei adds fixtures on the back of the phone such as the camera, the flash, the antenna, the modem, and the battery. This also includes the smartphone’s display and other parts. Huawei said each phone goes through a machine-controlled reliability-test. The P20 specifically is put through 10-hours of reliability testing, says Huawei. The reliability test includes various tasks like testing the battery, idle time, the period it takes to communicate with the phone and a temperature test. Other reliability tests include testing the handset in different environments, keypad lifetime, touch screen testing and sound tests. At this point, Huawei’s final EMUI software is added to the device, and factory workers perform the physical testing of each phone. After the phone goes through hours of reliability tests, it gets into the hands of several factory workers that have very different jobs. One person is in charge of turning the phone on and making sure the buttons function. Another individual sits in a soundproof room and tests the audio of each phone. Next, another Huawei production line employee is in charge of putting on that plastic screen protector that we all are too afraid to peel off. The phone is manually placed in a box that is prefilled with the charger, headphones, charging cables and whatever else a smartphone typically comes with. Each box slides through to get secured with plastic and another factory worker ensures each box is up to par and placed in a shipping container. Ten P20s fit in one box before it gets sealed off and is sent to a facility to be shipped to buyers. That phone then gets delivered to the thousands of stores around the world and finally to a consumer. Amusingly, by the end of the tour, the one thing that I really wished I had was the ability to hire the factory work in charge of perfectly putting on a screen protector whenever I got a new phone.